Matti Kontio is a composer, arranger and producer of children's songs and vocal and instrumental music based on the Finnish folk tradition. In addition, he is a performing musician on the kantele - a plucked instrument of the zither family and Finland's national folk instrument. Kontio has been a member of the folk-jazz group 'Karelia', always striving for a dialogue between ancient and contemporary music. 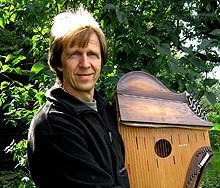 Together with his wife Sinikka, Matti Kontio forms a duo which belongs to the leading performers of Finnish kantele music.